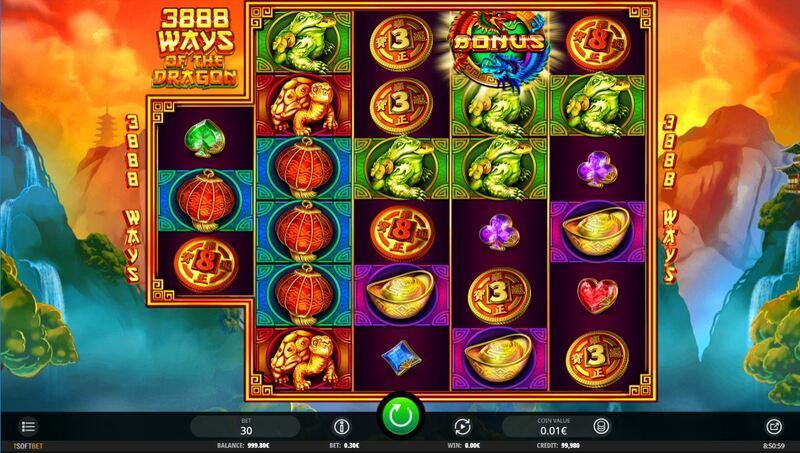 3888 Ways of The Dragon slot is one of those rare games that I immediately warmed to when playing for the first time. As you may have guessed the title refers to the game mechanic and it's an Oriental theme with a grid set over a mountain landscape and has the mandatory Chinese music soundtrack to soothe you into playing what can be a very fiery slot! 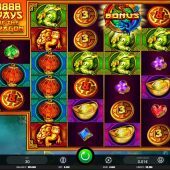 Now iSoftBet releases seem to jump from one extreme or the other, either being very playable or quite forgettable and fortunately for us 3888 Ways of The Dragon is in the former category. This may be because of the Eastern theme as they've previously produced some decent ones including the Dalai Panda and the Mystery of Longwei so do we have a case of Eastern promise or is this 3,888 ways to bust our bankroll? The colourful grid creates the 3888-way format by having a first reel of 3 rows and the remaining four reels of 6 rows for which we pay a stake of 30 coins to spin. Icons are stacked in various amounts from singly to four-high and we shall see the 5-of-a-kind pays for an idea of volatility. You don't see a Wild icon initially but worry not you do get some spectacular Wild action later, so our best payer is Frog at 100 coins, Turtle 60, Gold Dish 50, Lantern 40, 3 or 8 Token 30 with four card suits offering either 20 or 15. Scatters only appear on the four 6-row reels but how do we get those important Wilds? On any spin you may notice the reels dim and spin slowly which heralds the introduction of the spectacular Golden Dragon which will appear on the grid 3 or 4 times. After these sweeps you will left with 3 to 8 randomly placed Wilds then the reels will stop, usually with a decent win. You get 8 free games when 3 bonus scatters appear on the 6-row reels anywhere, or 18 if all 4 appear. During these there is a much higher incidence of the Dragon Spin occurring, usually around 50% of the time. You cannot retrigger them but rarely will they disappoint either.